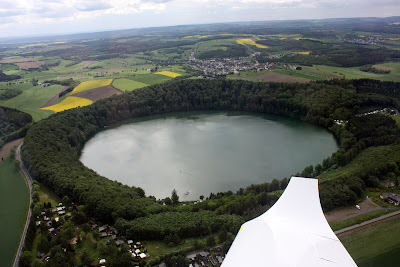 Sediments from Lake Meerfelder Maar, a maar lake in the Eifel/Germany, were analyzed to determine annual variations in climate proxies and solar activity. The period of least solar activity in the cycle of the Sun is called a Solar Minimum. During a solar minimum, there is diminished activity of sunspots and solar flares for days at a time. Identifying a solar minimum is done by taking to account the average duration of sunspots spread over more than 12 months of solar activity. This means, knowing the period of a solar minimum happens after it occurs. Since solar activity is a spontaneous or non-linear phenomenon, predicting a solar minimum is not as accurate as scientists would want it to be. Solar minimum is characterized by a period when there are less sunspots, sometimes days or weeks go by without any sunspot activity. Solar flares subside. It's a safer time to travel through space, and a less interesting time to watch polar skies because of an associated decrease in solar radiation.